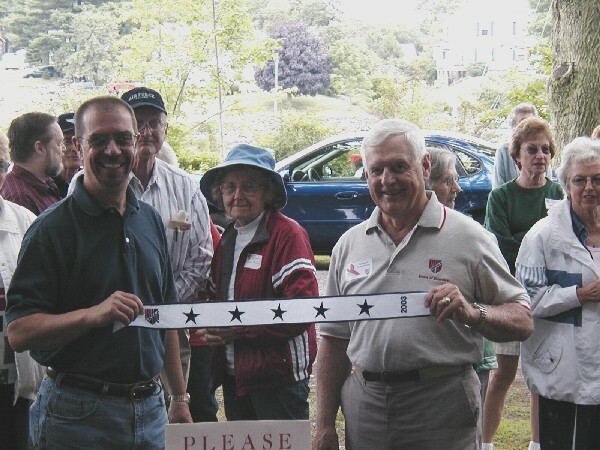 At this year's Clambake on August 2, 2003, the New Hampshire Chapter was presented with a "Battle Streamer" for being selected as a 5 Star Chapter (top of the heap) for 2002, in the "Large" Category (900 or more members). (Our Chapter tied with the Ark-La-Tex (LA) Chapter.) The Chapter also received a certificate for recruiting "excellence" for 2002. The presentations from MOAA national were made by RADM Ed Nelson, USCG (Ret. ), national director of MOAA. A July 24, 2003, announcement by Department of Veterans Affairs (VA) Secretary Anthony Principi will allow certain veterans to get their outside or private physician prescriptions filled by a VA pharmacy. A VA appointment is not necessary, but the VA emphasized that it urges these veterans to follow up with a scheduled appointment. • been waiting more than 30 days for their first appointment with a primary care physician as of Sept. 22, 2003. The first prescriptions will be filled under the new program Sept. 22, 2003. Eligible veterans will be unable to get prescriptions filled before that date. The period between announcement of the program (July 25) and filling the first prescriptions (Sept. 22) is necessary to allow the VA to identify and contact eligible veterans and to put new systems and procedures in place to deliver this benefit.